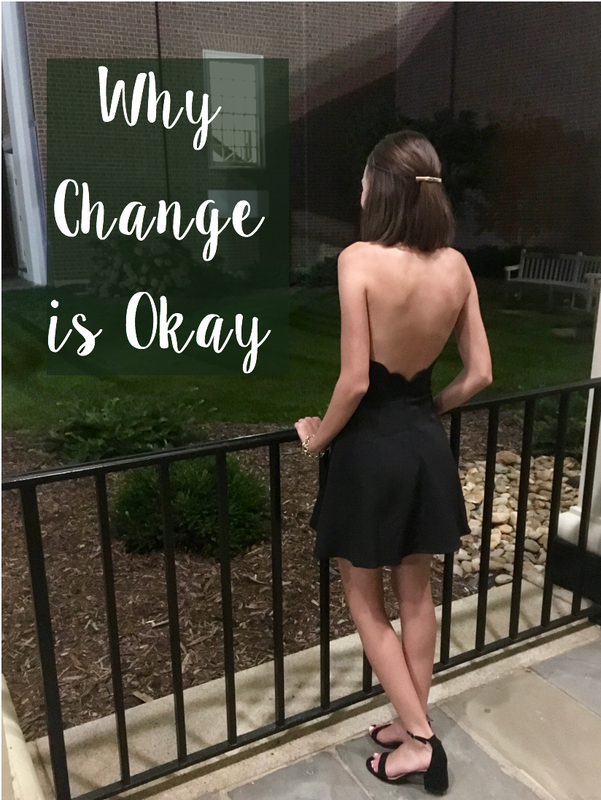 Have you ever been afraid to change? Maybe you're scared to get that new haircut or you're scared to rock that different style top? Maybe you're scared to reach out to someone new or maybe you're scared to end something? We all get comfortable with our lives and when we get comfortable there is no incentive to change. But sometimes change is necessary, sometimes that little inkling you get is exactly what you need. I remember last year around this time, I bought leather leggings. Leather leggings definitely don't fit into my otherwise preppy wardrobe of pinks, greens, and navy, but I liked them and thought they would be fun to style. But because I knew they weren't what people would expect me to wear, I never wore them. Okay well, I wore them once, but it was to a party and I'm sure they just looked like normal leggings. But I'm realizing that it's okay to want to wear something different. It's okay to experiment and have fun, especially with clothes. It's okay to challenge people's perceptions of you. You can bet that as soon as it cools down, those leggings will be one of the first things I style. And while being able to change your clothing styles is important, this issue touches a bit deeper as well. Sometimes you feel trapped in a box, life feels very planned out and you're on a path that you can't seem to get off. But it's okay to jump off, it's okay to change the path you're on. Maybe it's deciding that a relationship isn't working, maybe it's deciding to change your college major or maybe it's just deciding to live a happier, healthier life. You don't ever have to feel stuck if there's something you don't like about your life than work to change it. For me I've always struggled with negativity, I'm not a super positive person. For a long time, I kind of felt stuck, like there was no way to make myself become more positive. I think I felt scared of change, scared of what would happen if I did change. But this summer I decided that I was going to embrace a more positive lifestyle, I grabbed change with open arms. In the end, I'm so glad I did because now I find myself happier, I find myself living a life with many more smiles. Simply put, you are never stuck. Life holds a wide range of opportunities and it's okay if you have to change your plans to get where you want to be. So wear that super cute new top and change your plans, because if it improves your life at all then it's worth it.